What makes a garden good? For me, it can be summed up in three words “soothing and engaging”. Soothing. In the garden that I love the sense of balance and the feeling of tranquillity gets absorbed from the garden almost directly into the soul. It’s like the garden has found a way to bypass the logical part of my mind and connect through all the senses straight into my soul. The balance and tranquillity come from the blend and combination of colour, shapes, textures, smells and sounds. Yes sounds because the best gardens have unique and relaxing sounds that come from nature. It can be birdsong, it can be running water and it can be the way that the garden channels the wind. A good garden also has a little bit of ruggedness to it. It is a true reflection of nature in its combination of colour, shapes and textures. Not too ordered and not too bold. An hour in a good garden is like a week on vacation – relaxing, uplifting and reviving. We have all seen beautiful gardens. For most people that love the outdoors and nature, a good garden is something they cherish and desire. So what makes a good garden? Maintenance is the first key to having that beautiful and well-tended garden that will be the envy of many. Maintenance and tending will involve a lot of dirt, pruning, picking blooms and deadheads. It is also very important to follow the weather conditions. If it is during the rainy season, then you would need to ignore watering your plants to avoid drowning them. Alternatively, if it’s dry, then you would need to water them adequately to prevent them from drying up. For people who love gardening, it is a way to express one’s love for nature. Individuality is designing the garden space to go well with your home’s architecture, this will be the key to a great garden. Choosing plants will be the next step after settling on a layout. Plants should be chosen so that the texture, color, and sizes all fit well together. A good garden will tell you the owner’s individuality. It will welcome people in with warm hospitality. Collaborate your home with your garden creatively and where possible use the natural landscape that is available to you. The design of a garden is totally a personal thing. It is also regarded as an expression of one’s personality. Things that a person likes might not be preferred by others. There are people who like tidy gardens whereas there are some who prefer the thrill of windy paths. Generally, there are three different styles of garden. These are formal, semi-formal and informal. These can be further divided into several kinds of gardens depending on your choice. If you want to make your garden impressive then you can follow few valuable tips mentioned in this short note. Experts suggest Mediterranean garden, English cottage, tree garden, tropical garden and formal gardens are most impressive. Mediterranean garden: it is a time-consuming method in which you can do plantation of Bougainvillea, citrus trees, and olive trees. English Cottage: in this category, people can use roses, daisies, lavender, ivy types, daffodils, jasmine and other flowering plants. Tree Garden: another time taking process but very attractive. Once the plantation is done properly there will be enough shades and greenery everywhere. Citrus trees are best in such type of gardens. Formal Garden: this garden is best for residential and small areas. Plantation of fruit trees comes under this type. Tropical Garden: many people love the tropical climate. Plants for dry or wet tropics are available in the market that can be used in this garden. A good garden landscape should not only be for your viewing pleasure but should also be pleasant for others. Obviously, it should be well designed and should contain some of your favorite flowers or trees, maybe even plants that you can relate to or can take you back to your childhood or happy memories. But a good garden is not just that. You need to feel connected to nature and feel a sense of peace, quiet and connection. It needs to be a place where you love spending time, be it for reading, meditating or just contemplating. If you seek relaxation, a great garden should give you that. You can put fountains or even other water features to enhance the sense of a natural landscape and give you that extra element that is best suited to bring you in a good mood. A walk in a good garden should make you come alive, feel peaceful and happy. A good garden must reflect something of you and have the ability to bring pleasure when spending time within it A garden must be in balance with your house and climate especially when you want a beautiful garden all year round. A garden landscape with trees appears well rounded with a bench under it. A magnificent fountain significantly changes even the dullest garden when used as a focal point. Bringing a bit of color into your garden strategically is a good option when you use consistency throughout. Often the simplicity of a garden landscape with one focal point especially when size and space is a problem is a good option. Your own preferences concerning lawn, paving or pebbled walkways are a matter of personal preference. Your ultimate goal in creating a great garden is pleasing yourself and others who will spend time in the garden. Sitting in the shade on comfortable garden furniture, hearing the fountain dribbling over rocks, birds singing in a tree and the fresh fragrance of flowers in bloom, now that is a great garden. What makes a good garden? In essence, a good garden is a garden that will exhibit uniqueness in its formation. Well, gardening is more or less something one does to express him or herself through style, function, and design. Therefore a good garden landscape should incorporate a number of architectural elements. It should be able to capture your vision as you move from one point to the other whereby you will find interesting things around every turn. A good garden will incorporate properly designed pathways, some signature plants that will give that garden its life and formation as well as enough space for you and the family to utilize. A good garden is one which is not only welcoming and conducive in terms of space and pathways, but it should incorporate features such as sculptures and architecture which will make the garden an entertaining and attractive place. Are there opportunities to expose your garden to wildlife and nature? This will be the hallmark of your gardening, blending your garden with nature to give a perfect sensation of originality. However, it will be essential to keep order as it will be you that needs to maintain it. The genus of plants known as Tillandsia is also commonly called Air Plants sometimes written as Airplants. Air Plants grow without soil. The Air plant, genus Tillandsia is a type of epiphyte. Without feeding roots (some types have what appear to be rooted but these are used for anchorage) they can be found normally growing on a host but they are not parasitic and take no resources from the host. Moisture and nutrients are taken into the air plant via it’s leaves or bracts from the air. They grow in many subtropical and tropical parts of the world. Mostly they come from Central and Southern America. 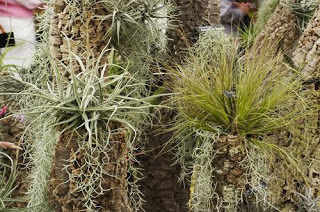 Nowadays they are distributed worldwide as many Tillandsia are sold as houseplants. One species, Tillandsia usneoides, the Spanish Moss is a common site in Florida, Louisiana, Georgia and the Mississippi areas. Some plants prefer dry desert climates, while others thrive in warm moist jungles. Tillandsia reproduction is normally by seed but vegetative reproduction can be carried out in some cases. A great beginner Air plant is Tillandsia usneoides, the Spanish Moss, in particular, it is very easy to propagate using the vegetative method. The Tillandsia are related to the Ananas comosus, the Pineapple and are in the Bromeliad family (Bromeliaceae). How do I look after air plants? 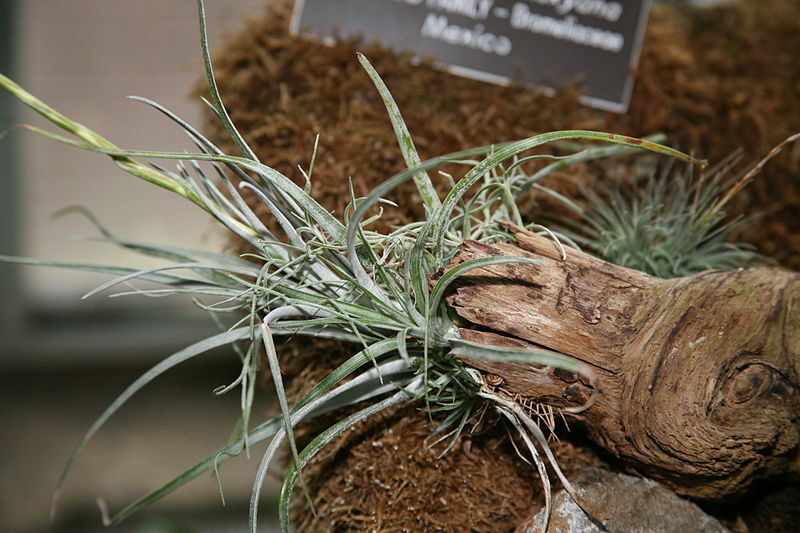 – How do I care for air plants? – How do I water air plants? – How do I display Tillandsia – Display ideas for Tillandsia Air plant. Air plants grow larger and bloom if they are kept happy. They are happiest when kept in warm, humid conditions with plenty of indirect sunlight. They do not like to be too cold or too hot and should be kept in conditions warmer than 10°C (50°F) and cooler than 32°C (90°F). An air plant can get a sunburn (brown patches) if it receives too much light and can lose its color if it gets too little. It is important to water air plants properly by thoroughly misting them daily (rain watering is preferable to tap watering) or dipping them in water for 5 minutes two or three times per week. If kept in a dry place it’s best to both mist and dips your air plant. Plants kept inside should also be fed with low-nitrogen quarter strength (one-quarter of the prescribed rate for bedding plants) fertilizer during Spring and Summer. The plant should be dry to the touch within several hours of being watered to prevent rot. Plants, when watered properly, should be turgid (stiff) and full but can feel soft, lose their color and have curled leaves when too dry or not watered properly. The flowers tend to rot easily so take care not to let them soak when in flower. Flowers can be cut off at the stem once they have died. The plant’s bracts will die naturally after some time but if the tips are moistened daily this can slow the process down. Once the bracts are dead you should be able to tug them off gently. Several weeks after the air plant blooms it will produce baby air plants or ‘pups’ from its side and the parent plant can produce several pups before dying. Once the pups reach about the same size as the parent they can be detached. The pups should come away smoothly without being tugged if they are ready. Air plants are not potted as they have no roots. They can be attached to other items such as rocks, seashells, mirrors, and driftwood (soaked to remove salt) as long as the item cannot be damaged by dampness caused by watering the plant. Plants can be attached using clear, waterproof glue as well as wire (note, do not use copper) or staples as long as they don’t staple the central part of the plant resulting in damage and inhibit growth. Your air plant can grow in any direction and if hung upside down on a string would eventually grow upwards to become a ball. Displaying your Tillandsia Air Plants can be a bit of a challenge for novices and beginners. When first purchased they might be glued to a log or a rock or some other medium like a piece of coral. Not to worry, if you don’t like it – Change it. Remove the air plant from the object very carefully. You can then mount it onto another object of your own choosing. Or if you prefer, place it in a pot. If placing in a pot – DO NOT USE SOIL. Either uses gravel in the pot or you can use Styrene foam – Break it up first – Place the gravel or styrene in the pot to about 1 inch from the top – Then add some sphagnum moss – Carefully place the air plant into the moss. If you feel that taking care of the lawn is nothing more than a nightmare, you should be told that it is one of the most pleasant habits that one can cultivate. You would find that lawn care can be made quite easy with the use of a few simple tips and you would no longer be afraid of the term lawn care. What must be understood is that having a well-maintained lawn does not only add to the aesthetic value of your house but it also gives that something to it also. So, we start with some of the lawn care tips. 1. Watering your lawn is an absolute must. You should water deeply and thoroughly every week. A six to twelve-inch deep watering would prove sufficient. And how would you understand that your lawn is being under-watered? Just walk over it and if your footprints remain on it, it is almost a sign of under-watering. Similarly, bluish tint and slow growth also mark under-watering. 2. Fertilization is a must. You need to have a good fertilization schedule. This would ensure strong and healthy grass growth. Generally, the amount of fertilizer also depends on your specific lawn but on an average, four pounds of fertilizer is applied per thousand feet. And you would do well to use slow release fertilizer. 3. When it comes to the percentage of ingredients in the fertilizers, it would also depend on the condition of your lawn. But generally, the ratio of nitrogen, phosphorus, and potash must be 2:1:1 in the spring season. And when it is the time of fall, you can use 1:2:2. That would help your plants to have healthy roots during winter. 4. Mowing is essential but equally essential is that you should let the clippings remain on the lawn. It has great nutrient value and adds humus to your lawn soil. Mowing should be done every five days during the rainy season and every ten to fifteen days during summer. 5. You should not wait for the weeds and pests to become uncontrollable. You should remain proactive about it. A good pesticide and herbicide schedule must be followed. 6. The blade of the mower must be sharp or new. If you use dull blades to mow, it would tear the grass. It is essential that if you don’t use new blades, you sharpen your blades every month and if your mower faces hard objects like stones, you would do well to sharpen your blade more frequently. 7. When you mow, you should cut grass diagonally with alternating directions each time. It does not allow your lawn to have a striped look and it also enables a thorough mowing of the glass. There won’t remain any uneven look in the lawn.